Summary: Residents of several US states consider butternut squash soup to be a traditional Thanksgiving staple. This makes sense to us, so we decided to give the dish a test whirl to see if it would work for our holiday feast. The answer is a resounding yes! This recipe is extra exotic, due to the addition of curry and cinnamon. Of course, it’s vegan, gluten-free, and absolutely delicious. Try it, we think you’ll agree. Chop squash into medium-sized cubes and bake in oven at 425 degrees until pulp is slightly soft. Remove from oven, cool and then separate skin from pulp. Discard or compost skin. Fry squash, onions or scallions, garlic cloves, curry powder, cinnamon, salt and pepper in coconut oil for about 10 minutes. Squash should be slightly browned. Your kitchen will smell wonderful! Pour mixture into large pan with coconut milk, vegetable broth, and maple syrup and simmer about 15 minutes until squash is quite soft. Remove from heat and transfer contents to blender. Mix at medium speed for a couple of minutes until pureed. The texture should be thick and creamy. Transfer it back into pan and heat for about 10 more minutes. Remove from heat and pour directly into bowls. This comforting, aromatic soup tastes incredible all by itself, or you can garnish with a drizzle or two of additional coconut milk, chopped thyme, chili paste, extra ground pepper, or any other topping of your choice. Feel free to experiment! Serve with a side salad, some gluten-free garlic bread, and for an extra kick, a glass or two of vegan red wine. 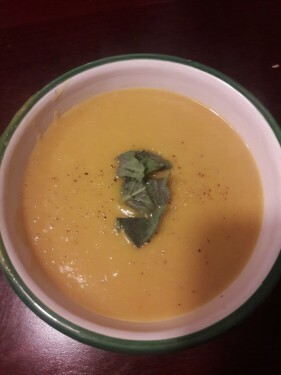 This soup serves four people and keeps well in the refrigerator for 3-4 days. You can also freeze it for approximately 1 month. However, we strongly doubt that you’ll have any left over. The delectable concoction will warm your bones and prepare you for autumn’s chill. Enjoy, and stay warm! Residents of several US states consider butternut squash soup to be a traditional Thanksgiving staple. This makes sense to us, so we decided to give the dish a test whirl to see if it would work for our holiday feast. The answer is a resounding yes! This recipe is extra exotic, due to the addition of curry and cinnamon. Of course, it’s vegan, gluten-free, and absolutely delicious. Try it, we think you’ll agree. Previous Article « Sweet Potato and Black Bean Veggie Burgers: Vegan, Gluten-Free, Amazing!